Grilling. Cheese. Sausage. Jalapenos. Done. Continuing on with my stuffing obsession, I decided to make my version of poppers. Years ago I was sucked into buying that ridiculous Williams Sonoma jalapeno grilling contraption- and love it. Although their recipe isn’t bad, I tweaked it a little (of course). 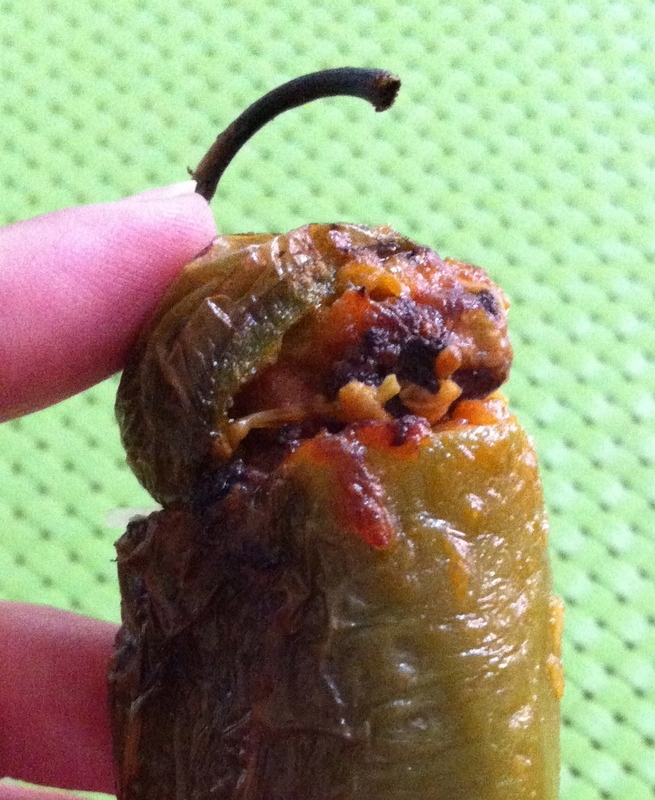 I’ve yet to meet anyone who does not love these peppers — even my mother, who can’t handle spice well, is a big fan. 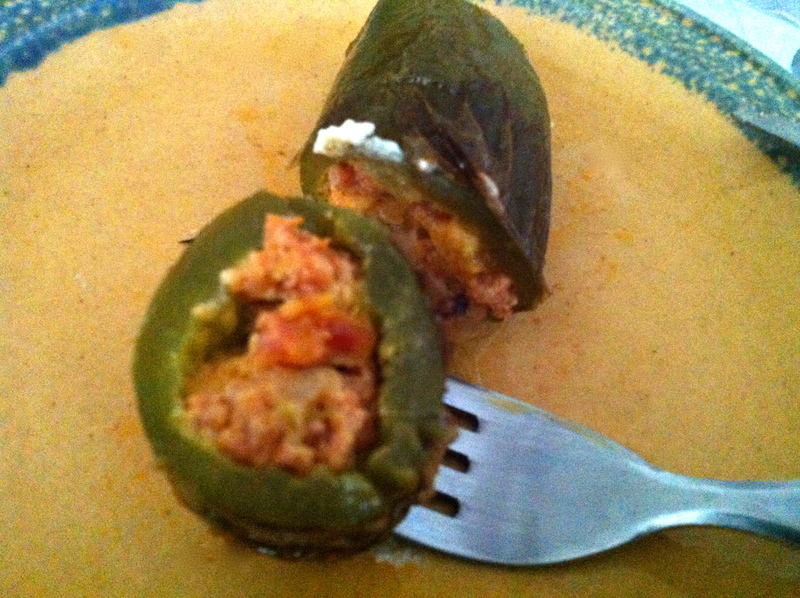 Choose jalapenos that are plump enough to hold the stuffing and not too small or thin. Can’t take the double dose of heat? Make sure all the seeds are gone from the peppers. Or use a non-spicy pepper or a sweet sausage. If you make a double batch of sausage or have leftovers after stuffing, the sausage-cheese mixture is also delicious with scrambled eggs. Cut the tops off the jalapenos leaving room to use the tops (about 1/4 inch down). Core the peppers. (Don’t get sucked into buying that silly jalapeno corer. If you have access to a grapefruit knife, go with that.) Rinse peppers well and set aside. Take chorizo or other sausage, preferably spicy, out of casings. Crumble into skillet over medium heat. Add onions to pan and sprinkle with cilantro. Mix thoroughly to break up the sausage and not burn the onions. Cook for about 7 minutes or until sausage browned and cooked mostly through. 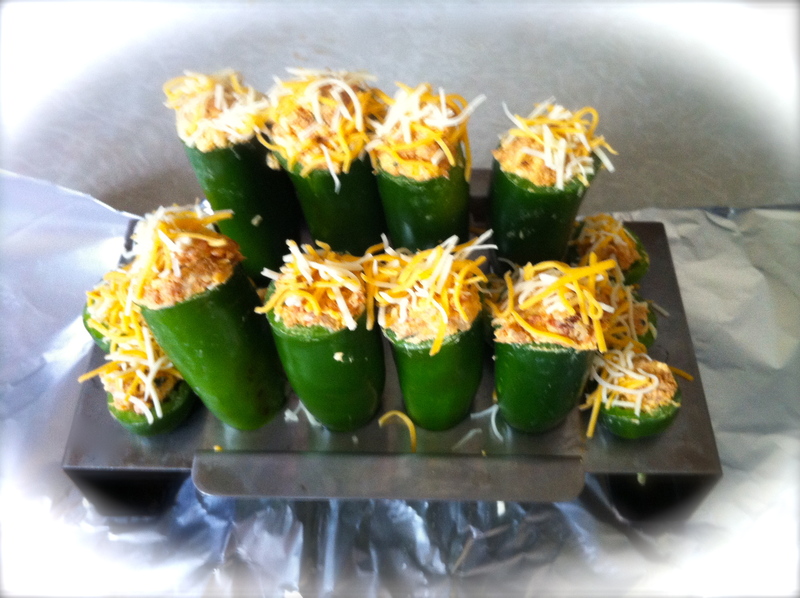 Place a small dab of cream cheese in the bottom of each pepper. Using your fingers, stuff sausage-cheese mixture inside of peppers pressing it in. Place sausage mixture in top of caps too. Sprinkle more mixed cheese on top. 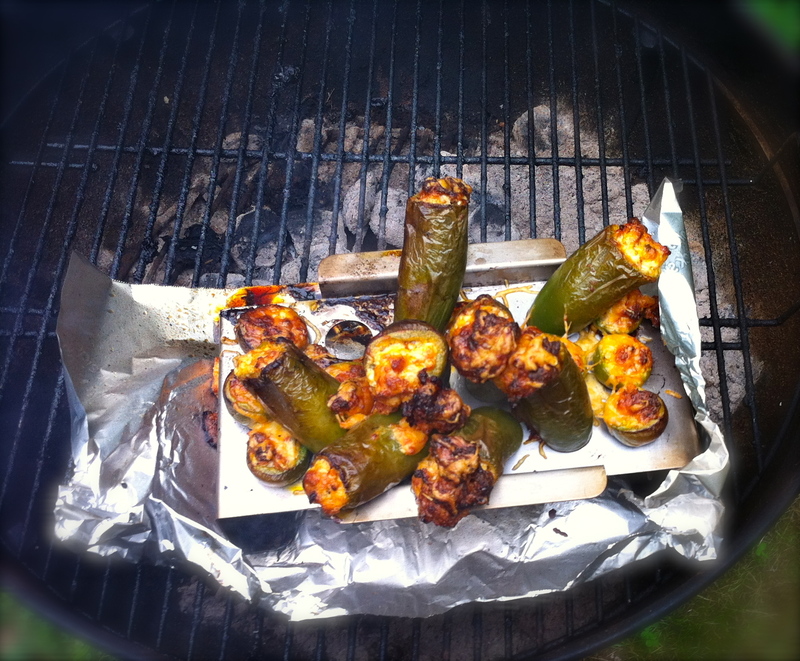 Let them stand in the special grilling plan with foil on the bottom to catch anything that falls. Otherwise, place in something that will allow peppers to remain stable. Put the cap on for presentation. 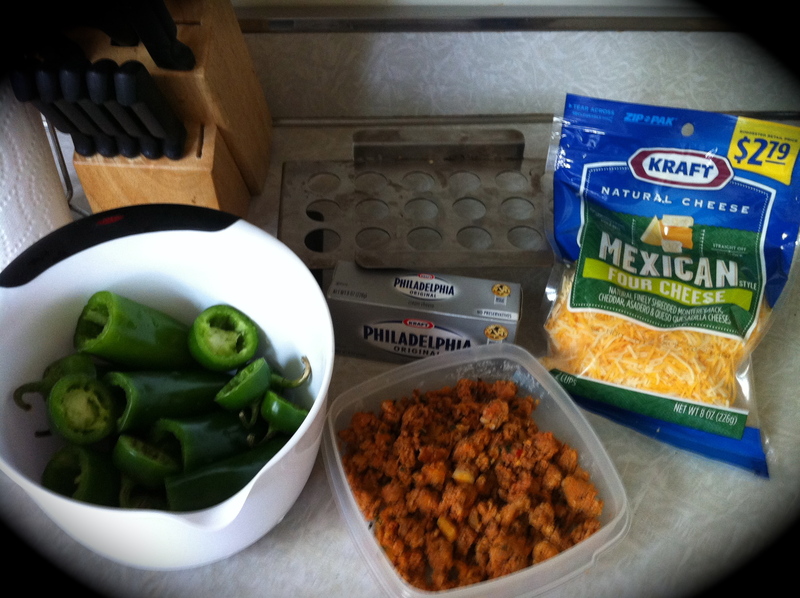 Preheat grill (can be done before, but I like to get the peppers ready first). Grill over medium heat for 20-30 minutes until peppers are charred and soft. Let cool slightly before eating. I have a hard time not eating the top right away on its own. It’s so full of cheese and sausage that it’s the perfect bite.